Priding itself on being a home away from home, Chongwe River Camp is regarded as one of the top-end camps in the Lower Zambezi Valley and, quite possibly, it has the most picturesque location of any camp in Zambia. The standards and service at Chongwe River Camp are excellent with emphasis on guests comfort, relaxation and enjoyment of an authentic safari experience. 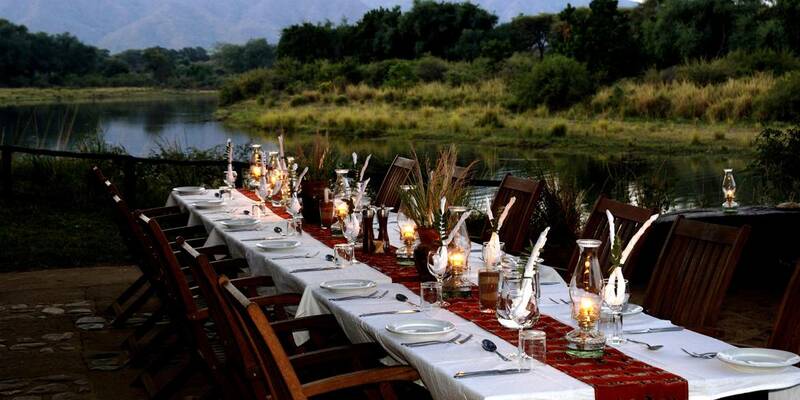 Chongwe River Camp is located on the west bank of the Chongwe River, where it meets the mighty Zambezi, and opposite the renowned Mana Pools. Sitting just outside the Lower Zambezi National Park boundary in the Game Management Area, it is a very game rich area offering breath-taking views of Muchinga Mountains to the north. 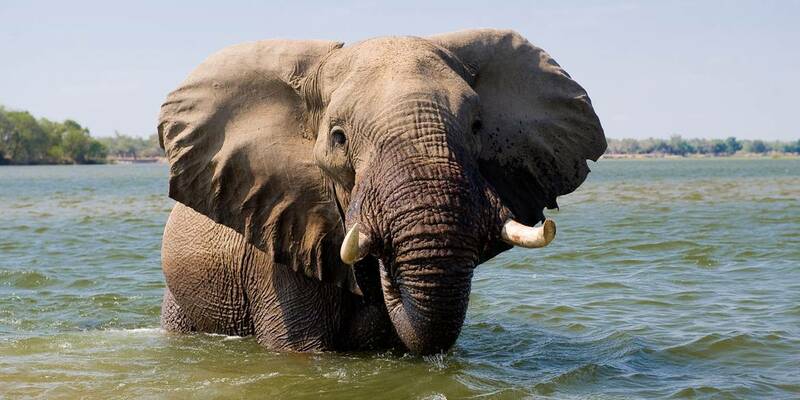 Zambia’s Lower Zambezi Valley is renowned throughout Africa for its magnificent herds of wild elephants, exceptional predatory viewing and, of course, the mighty Zambezi River. The main activity for wildlife watching at Chongwe River Camp is the daytime game drive in an open safari vehicle. There are plenty of lions, elephants, leopards, jackals, buffalos and spotted hyenas, as well as a wide range of lesser game and excellent birding. Wild dogs are seen occasionally too. Zambia permits spot-lit night drives in its national parks, thus allowing guests a window on another world. Large predators are most active at night and there’s also a better chance of seeing nocturnal animals such as genets, civets, porcupines and honey-badgers. Water-borne activities at Chongwe River Camp provide a memorable experience – whether canoeing, bird-watching by boat or taking a fishing trip. 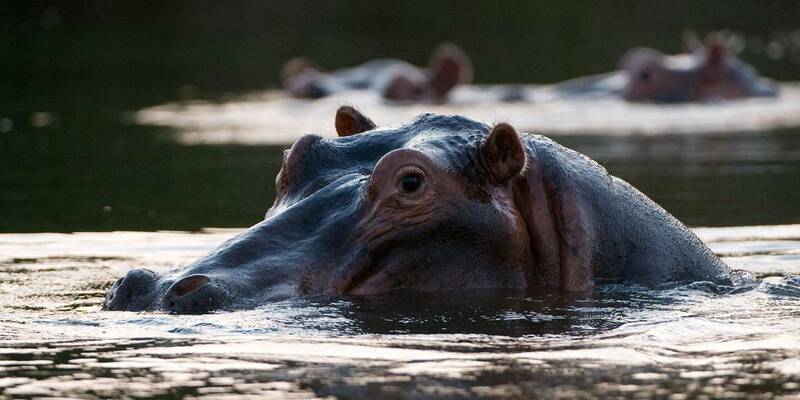 The Chongwe River is perfect for canoe trips as it’s relatively free of hippos and slower moving; offering the ideal opportunity to view the prolific birdlife along the banks including kingfishers, Pel’s owl, ospreys and carmine bee-eaters. Witnessing elephants, buffalo and lion lounging by the river bank from a boat on the Zambezi is a majestic sight and one that is eminently possible from Chongwe River Camp. Fishing is strictly on a ‘catch and release’ basis to preserve the stock, and the local speciality is tiger-fish, named for its striped body and razor-sharp teeth. Its fighting spirit and reputation make it one of the world’s top game fish. Walking safaris with an experienced guide and armed scout can be an exhilarating experience, as they allow guests to get close to wildlife, without a vehicle in the way. The Lower Zambezi Valley is fortunate to have some of the best terrain for exploring on foot. Taking a guided walk to the north where the foothills of the Zambezi escarpment form the Chongwe Falls is highly recommended. The elusive Samango or blue monkeys are occasionally seen here. Other species found in this little-visited area of the Lower Zambezi Valley are the diminutive klipspringers and bush pigs. Animals, most notable elephants, frequently pass through camp, and often come very close indeed, munching on acacia seed pods or stealing some cornflakes as they wander through. For those interested in the rich cultural heritage of the area, community visits to local villages can be arranged. At the Chiawa Cultural Village visitors can embark on a guided tour where they will learn about the lives of the Goba people, their traditions, trades, tools and art. 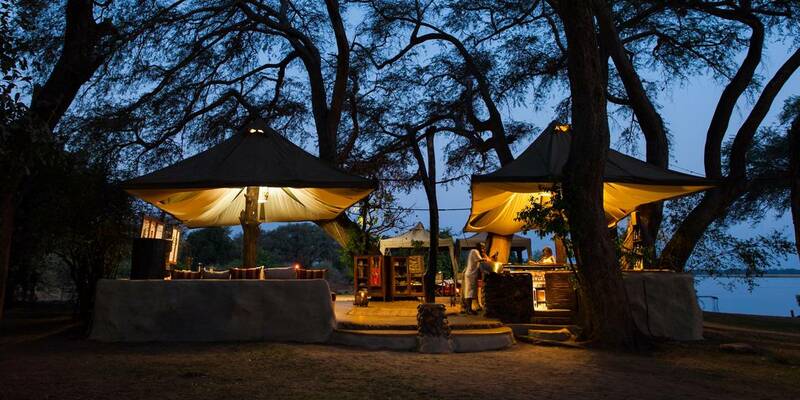 Dotted along the riverbank, under a canopy of acacia trees, are nine Classic safari tents. These comfortable, spacious and airy tents are built on polished concrete floors and covered with a canvas roof to keep them cool. Surrounded by lawns, they command stunning river views from their private verandas. 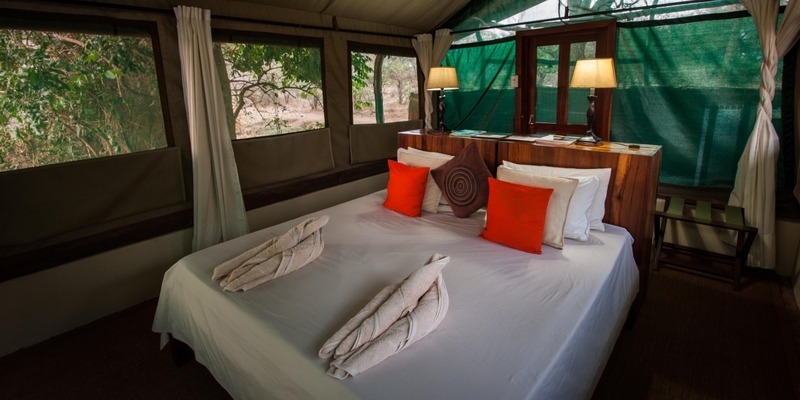 In addition to the Classic tents, Chongwe River Camp also has two exclusive tented suites which are luxuriously self-contained, each with their own private dining and lounge area, well-stocked bar, plunge pool and firepit. The colonial-style Albida Suite is located on the south edge of the camp, and consists of two separate, fabulous bedrooms, each with its own adjacent bathroom. Between the two bedroom suites is an elegant, open-sided lounge and dining area. This is perfect for a family or two couples travelling together. The beautiful Cassia Suite is built in the same style as Albida Suite but designed for two people with one bedroom and en-suite bathroom. It is hugely romantic, ideal for honeymooners; a perfect, private and intimate hideaway. Both Suites have separate attendants who act as private ‘butlers’ – briefed to look after their individual guests whilst perfecting the balance of being helpful and attentive without being intrusive. All of the Chongwe River Camp safari tents are equipped with enough luxuries to ensure that a stay here in the bush is exceptional. Cotton linens, local textiles and hand–crafted furniture blend seamlessly with organic fixtures and fittings. 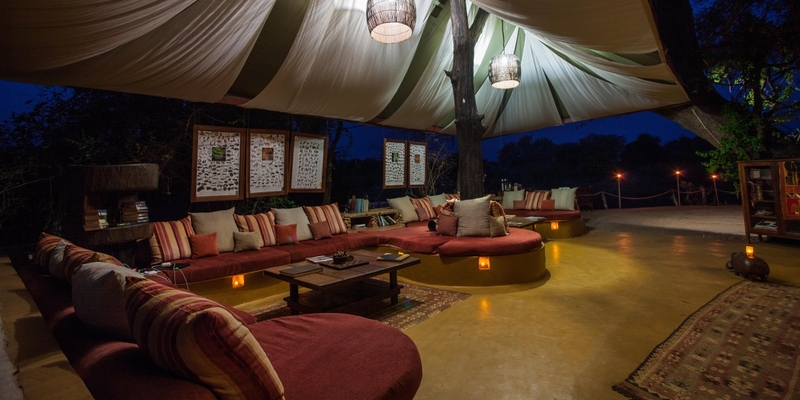 The décor is uncomplicated and relaxed safari style with neutral textures, colourful carpets and cushions. The open-air en-suite bathrooms are an experience of their own; where guests can shower under the stars or in the early morning sunshine. The main communal area at Chongwe River Camp is covered by a large canvas roof suspended from the surrounding trees. Beneath is a bar, relaxing lounge area and small library. To the front, overlooking the camp’s jetty, is an outdoor dining area and camp-fire encircled by comfortable armchairs. Guests staying at the Suites have the option of dining privately in their suite or joining their fellow guests.